Monday's action set the tone for the whole week. In response to bullish hopes for a trade deal, the S&P 500 opened ten points higher and made a significant rebound high at 2816.88. The high was made in the first thirty minutes of trading, but by 12 PM Eastern time, the S&P 500 was down 25 points. The market tried to rebound Tuesday, but the sellers took over again on Wednesday. It was a rough week, with the Russell 2000 down 4.26%, and the Dow Jones Transportation Average down 3.3%. However, both are still showing a double-digit YTD gain. That is also true for the Nasdaq 100, which held up better last week than the Dow Industrials or S&P 500. The selling increased as the week progressed, and the much weaker-than-expected jobs report on Friday was not reassuring for investors or traders. There were some significant changes in the daily technical outlook last week. The iShares Russell 2000 (IWM), which led the other market-tracking ETF's from the December lows, is already down 5.6% from the February 25th high. The daily starc- band has been tested for the last three days, which is a sign that IWM is oversold. The former downtrend (line a) is now being tested with the next band of good support in the $147-148 area. There is first resistance at $154 and at the declining 20-day EMA. 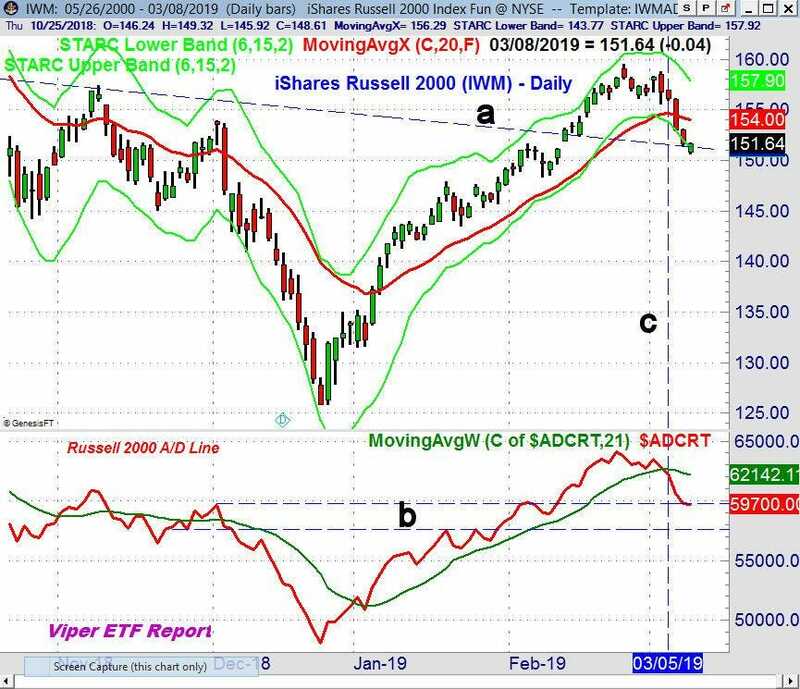 The daily Russell 2000 A/D line made a new high with prices in February but dropped below its WMA last Tuesday, March 5th(line c). The A/D line has already reached the start of next good support (line b). With Wednesday’s close, the daily advance/decline lines for the S&P 500, Nasdaq 100, and NYSE (Stocks-Only) also dropped below their WMA's. This turned my daily Viper A/D Trend analysis negative for the first time since January 4. By the end of the week, all of the A/D lines were below their WMA's.